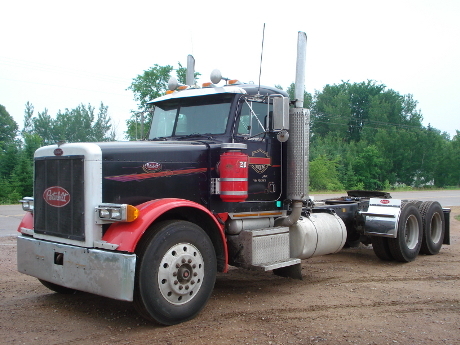 Peterbilt Trucks is a company known for producing high-end heavy duty trucks. They have an excellent network for giving quality services to their customers. Their quality products and excellent services have allowed the company to build up a huge customer base in North America. Whether it’s the highways, city streets, logging roads or construction sites, red symbol of ‘Peterbilt Trucks’ signifies reliability, pride and performance of the company. Peterbilt Motors Company manufactures medium and heavy duty trucks (Class 5 – Class 8). They are a subsidiary of PACCAR and have their headquarters in Denton, Texas. The company was founded in 1939 and has its manufacturing facilities in Madison (Tennessee), Denton (Texas) and Sainte-Thérèse (Quebec). From early-1960s till mid-1980s, Peterbilt was based in San Francisco Bay Area (Northern California) with its parts development, main plant and headquarters in Newark, California. However in 1986, Newark plant was closed and the headquarters and engineering (1993) got moved to Texas. Driven for satisfying the job challenges and unique needs of their customers, Peterbilt manufactures every custom truck completely following their specifications. Again, whether order calls for fully-appointed owners’ truck or unit for fleet requirements, Peterbilt Trucks are manufactured for the same standard of critical quality. Conventional model of Peterbilt features precision-tooled and lightweight aluminum cabs. They have a variety when it comes to suspension systems for smoother and quieter-ride. These trucks also consist of a 20-bolt cross member unit, which helps in giving it extra frame of durability. The blend of custom manufacturing and premium quality in most Peterbilt Trucks leads to highly efficient and long-lasting products that can adapt to wide range of markets and applications. Several surveys have suggested that most drivers consider Peterbilts as preferred brand of trucks. Again, fleet owners cite purchase of their trucks as way of attracting and retaining quality drivers. Peterbilt has been working hard for attracting more customers to their helm. In recent time, Peterbilt Trucks have introduced more new services and products than what it did before. Trucks & sleepers, which appeal to broader range of industries, offer more options, safe components and comfort factors than all the others in their class. Again, customers of the company seem satisfied with the aftermarket support that they receive through Peterbilt’s TruckCare Services & Peterbilt Dealer Network. Peterbilt’s TruckCare service features full range of services, which includes 24-hour assistance on road and scheduled programs for maintenance that is given to fleets, owners and operators. Peterbilt Trucks have reigned as the premium truck manufacturer of America, since it was established in 1939. With a full-line of Class 6-8 trucks, proven array of TruckCare aftermarket’s support program and a respected network of dealerships in North America, it has continued to be a leader in the industry. The dedication for delivering products and services along with focusing on improving customers’ image, profitability, peace of mind and performance truly makes Peterbilt Trucks, a name to watch out for in heavy duty trucks.